Power Your Mind naturally with Hypnosis to stop the destructive habit of binge eating – for good! Enjoy freedom from binge eating with this self-hypnosis mp3 by Steve G. Jones! finally overcome being a binge eater!!! Binge eating can take over a person’s life, leading to stockpiling of fattening foods, and planning when to privately ‘pig out’ . Bingeing may follow a period of attempted weight loss, sometimes leading to the now well-known phenomenon of yo-yo dieting – a dangerous and ineffective dietary pattern. In some ways, binge eating is a natural response. In ancient times humans had to gorge on any food that was available because as food was often scarce. Now food is everywhere in the western world, making this old pattern redundant – although the unconscious mind can still use it of course. This Stop Binge Eating Hypnosis MP3 session can help you switch off this old out-of-date pattern to give you more control over your eating. Not only will this Binge eating hypnotherapy Mp3 bring you closer to any weight loss goals you may have, but you will also gain more self respect and generally feel better about yourself. However to stop binge eating you need to be motivated – it can feel easy and natural when you go about it the right way.By using my binge eating hypnosis Mp3, Stopping binge eating can make you feel so much better about standing up to your binge gremlins and kicking the gorge habit for good! Binge eaters benefit in many ways from hypnosis. It is a slightly different technique than that used in overall weight loss programs that rely on hypnosis. With binge eating, the person engaging in the feeding frenzy isn’t necessarily overweight. Binge eaters come in all different sizes and shapes and with many different emotional triggers. 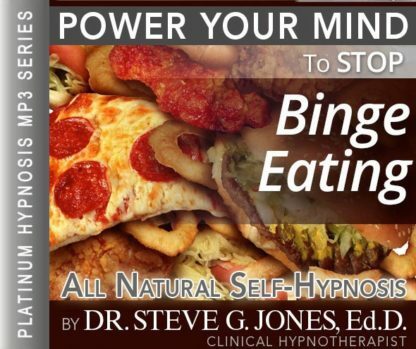 Steve G. Jones is a clinical hypnotherapist who has taken these principles of hypnosis and turned them into a program called, Stop Binge Eating Hypnosis MP3 audio. In no time, triggers that once led to binging will now engage a much healthier response. Power your mind to overcome binge eating successfully with Hypnotherapy!!! You can get all the benefits for this low price. Simply listen to the Stop Binge Eating Hypnosis MP3 download every night as you go to bed for three weeks and feel the changes happening in your life. You will feel more empowered, more in touch with your true self, and you will truly know that your goals are within your reach. I recently had a friend who had a heart attack. The doctor told him that there were two major things he needed to change about his lifestyle. One was that he needed to slow down and reduce the amount of stress in his life. But the other reason was that he needed to change his eating habits. He was so busy with his job during the day that he would survive on coffee and then when he got home from work he would binge on food that wasn’t very good for him. He wasn’t overweight, but eating your daily caloric intake in one sitting can take a toll on your body. Perhaps you are like my friend, or perhaps you get a craving for a certain type of food and you cannot control yourself. I have had many clients over the years with this problem. People tend to zone out while they eat and before they know it, they have eaten way more than they should have. I always suggest that people be more aware of their eating habits. Eating five or six small meals is the healthiest way to eat. Being aware of serving sizes is also important. I encourage my clients who are struggling with their eating habits to keep a food journal. They write down exactly what they eat and they also keep track of the number of servings. If you have a problem with binge eating, I encourage you to seek help in order to control you eating habits. And as you continue to relax you realize just how powerful you are and you realize just how much self control you have. You are a powerful person with a tremendous amount of self control. And you allow yourself to change negative eating patterns into a positive relationship with food and you allow this to take place easily and effortlessly. You are so very relaxed. And you find that you eat very small portions of food when you are hungry. You imagine your body to be like a furnace and you realize that you must keep that fire burning at a constant level, giving yourself an appropriate amount of energy in the form of food throughout your day. And so you keep the furnace stopped. And you are relaxed. You eat appropriate amounts of food when you are hungry and once you have eaten the appropriate amount of food you simply stop eating, you stop eating. And you realize that you are very comfortable eating small amounts of food on a regular basis, small amounts of food on a regular basis because you are relaxed and at ease. And if at any time you should feel any urge to go beyond a small amount of food, you should deal with the issue that causes those feelings, you deal with that issue in a very straightforward, direct, and mature way. And then you continue to relax and day by day you are becoming better and better at dealing with issues in your life. You see them as challenges which you will overcome. And so when you think of food you only think of eating food for energy. And you eat small amounts of food when you are hungry. And you relax between meals and you relax now deeper and deeper. Binge eating is a disorder associated with episodes of uncontrollable overeating. Whether binge eating for you is related to an eating disorder or not, it is important for you to get in control of your binge eating. The good news is that you are in control of your eating, even if you do not feel like you are right now. This powerful hypnotherapy program will help you gain control over your eating habits and rid your life of binge eating. The Stop Binge Eating hypnosis program will make you take up healthy eating patterns. You will want to eat smaller meals throughout the day. This healthy way of eating will boost your metabolism and leave you less hungry throughout your day. We suggest you listen to this hypnosis recording for 21 nights in a row to allow the positive suggestions to reprogram your subconscious mind. You will change the way you see and feel about food. You will have a good and healthy relationship with food after using hypnosis to stop binge eating.